On Valentine’s Day, many of us will be baking or buying sweets for our loved ones. And I’m no different. Andrew, the girls and I will have dinner at home on Tuesday (somewhere between a piano lesson and theory class), and I’ll make sure I end the meal with something sweet to make everyone happy. But earlier in the day I’ll be serving a sweet that no one but me really likes. At lunchtime, I usually eat on my own, so it’s a good chance to make something that only I enjoy eating. And on Valentine’s Day, that will be sweet potatoes. True, Andrew doesn’t mind sweet potatoes in small doses. For example, as a modest side dish to whatever the main course is. But he has never made a meal out of a sweet potato and a little salt, like I have. And he isn’t the one who wistfully reads sweet potato recipes and dreams of a day when her family will love them as she does. I didn’t like them as a kid, which is why I still hope to convert my girls. Now, knowing all the health benefits and wonderful taste of sweet potatoes, I can’t imagine feeling any other way. So for Valentine’s Day lunch, I’ll make these delicious sweet potato rounds to enjoy by myself. And if my family is reading this post, I promise the most romantic thing of all – I won’t serve any of the leftovers to you. Preheat oven to 450 degrees. Coat a large baking sheet generously with 1 to 2 Tbsp olive oil. Lay sweet potatoes in one layer on the oiled sheet and sprinkle with salt. Roast, without disturbing, for 15 to 20 minutes. Carefully flip each piece. Sprinkle with additional salt and return the pan to the oven for another 10 minutes. Meanwhile, prepare the salad. Chop the pecan halves and the celery and mince the cranberries. Crumble the goat cheese and combine with other ingredients. In a small dish, whisk together 2 Tbsp olive oil with red wine vinegar and Dijon. Mix with the salad. Scoop a spoonful of salad over each sweet potato round and serve. I would join you for lunch and fight you for the leftovers! I'm the only one in my house who likes sweet potatoes too. These look delightful! I love sweet potato fries and chips, but I confess to never enjoying them in healthier forms. That may change very soon! These look great, Beth! I think my kids would eat them if they knew the recipe came from you. HAPPY VALENTINE'S DAY TO YOU AND YOUR FAMILY! I would join you, I could make a meal on those. They look delicious. And a nice change for me from just plain old sweet potatoes. Have a happy Valentine's Day! This is an interesting way to present sweet potatoes. I love recipes from SK so I am sure this recipe is a winner. Oh boy, guess it IS Valentine's Day. I love this creative way to enjoy something so sweet. Sweet potatoes are often too sweet for me! But I love the tart and the creamy that you brought here. My husband loves these – I wonder if it is possible to make a bouquet out of sweet potatoes???? I do the same thing! My lunches are usually foods that no one else enjoys. I'm glad you're treating yourself on Valentine's Day with this most delicious sweet potato (I love all the toppings!). I adore sweet potatoes, while the rest of the family merely tolerate it. Actually, the youngest hates it, and the only way I can get her to eat without complaining is to hide it in soup and mash 🙂 I will definitely be making myself this dish for lunch one day too. Thank you. Sweet Potatoes are a cross I am left to carry on my own as well. But I will be considering these your inadvertent Valentine's Day gift to me, because I so love actioning them when Marcus is out and about. They're always welcome to be a meal on their own. And, since I know you won't post again until Thursday, Happy Valentine's Day! Both my hubby and I love roasted sweet potato but my son isn't too keen, although he will shuffle them around his plate and some do disappear. I haven't found any under the table mats, or our dog lying near the table with a full tummy, so he must eaten them unless he fills his pockets of course? I think the idea of having a special lunch for yourself for Valentine's Day is a great idea Beth, and one I've decided to adopt. Carla, I wish my girls ate sweet potatoes like your boys do! And Kat, thanks for the Valentine wishes, and enjoy my gift to you! What an awesome idea, I love the way they look! These actually sound really delicious, esp with nuts and berries. Almost a dessert if you leave out a few things. I am in heaven thinking about this dish. I'd never thought to TOP a sweet potato like this. What a wonderful(extra!) way to be celebrating Valentine's Day! A private treat! I'll be remembering this one! Those look great, Beth. I love sweet potatoes! I'm a huge sweet potato lover too. Fortunately my wife enjoys them as well, so my problem is finding new ways to use them! They're terrific in a vegetarian chili (sweet potatoes go so well with spicy). I've not tried them with goat cheese and dried cranberries – that sounds like a wonderful combination. Thanks for the idea! I too would have to eat this alone at lunch–but it looks yummy! i really enjoy sweet potaters, and this preparation would be a hit with me! I'll be over around noon. 🙂 I'm pretty much the only sweet potato lover in this house as well. Scott will eat them on occasion, but it's a lucky day when I can get the boys to put some down; even sweet potato fries don't go over well. More for us, right? These sweet potatoes have my name all over them! 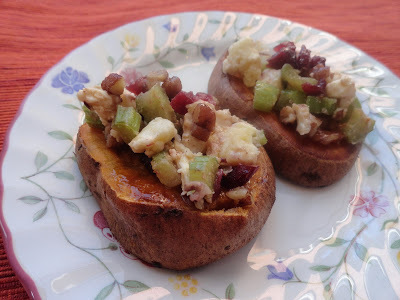 My favorite 'comfort food' is you guessed it, sweet potatoes, I usually love them baked with meat loaf but I like what you've created here-very much! With goat cheese? Yes please! I never used to like sweet potatoes, but I'm developing a taste for them now. I don't like them by themselves, but I do enjoy them in soup or with plenty of toppings. Happy Valentine's Day! These look like the perfect Valentine's treat to me! YUM! I love sweet potatoes – my husband does too but we just can't convince our girls that it's like eating dessert! This sounds yummy – love the idea of goat cheese and the pecans in here – yum! What a great idea with those little sweet potato rounds. I am going to try these, we love sweet potatoes and with just Mark and I at home now, we could make these easily. They look delicious. These sweet potatoes look so cute and delicious! I like the topping combination a lot. I am a big fan of sweet potatoes! I didnt' like sweet potatoes as a kid either but now I can't get enough…so yes. there's still hope. I've been meaning to make this dish since SK posted it! So yummy. There are many things I did not like as a kid that I love now. So like you, I am hoping my kids will come around eventually to many of the foods I really enjoy. I adore sweet potatoes and would love them served this way, wonderful contrast of flavors. Beth these potatoes look incredible! I love sweet potatoes. 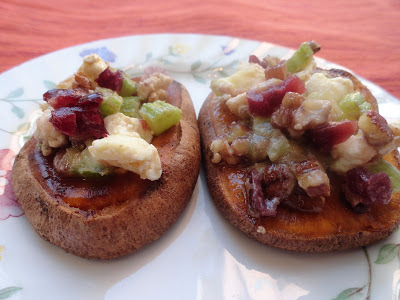 I miss sweet potatoes…had lots of them when I was as a kid, but never with goat cheese. Love the idea. Oh I just love sweet potatoes and this combination of flavors sounds so, so fantastic! What a lovely sweet potato recipe–such an unexpected yet wonderful combination of ingredients! I served sweet potatoes for dinner on Valentine's Day too. We love them plain. It surprised me how quickly they cooked when I first started cooking them. I think they are much faster than regular potatoes. What a delicious way to enjoy sweet potatoes! Thanks for sharing and inspiring me with something new. You have a great blog! Beth, what a great treat for yourself. These flavors are great! Hope you're doing well! Have a nice weekend. I often bake sweet potatoes for my lunch however, I've never added anything that looks so delicious to mine! Must try this! I have just recently gotten my husband to eat sweet potatoes…he loves them cut into fries and baked with olive oil!